FORESTS hold the centrestage in climate change. They can reduce carbon emissions up to 10-20 per cent of what has been projected by 2050. The Intergovernmental Panel on Climate Change has said that the greatest potential for carbon capture exists within tropical forests. Based on this assumption, there are plans to offset the build-up of atmospheric carbon dioxide by avoiding deforestation and encouraging afforestation in tropical regions. However, some findings have revealed that simply planting of trees will not do. Certain factors play a potential role in sustaining terrestrial ecosystems. A recent study brought to light one such factor--the trace element called molybdenum (Mo). As trees grow, increased demand for carbon dioxide leads to a corresponding rise in demand for nitrogen. Tropical forests get their nitrogen from bacteria living in soil that turn atmospheric nitrogen into biologically usable ammonium. In areas where man made fertilizers do not come into play, this form of nitrogen is the primary input for growth. Despite tropical forests harbouring such bacteria abundantly, the conversion of atmospheric nitrogen into ammonia (nitrogen fixation) is very limited. A short nitrogen supply hampers plant growth and in turn limits the trees' capacity to absorb carbon dioxide. Micronutrients like Molybdenum and minerals like phosphorous (P) are derived from the weathering of rocks. 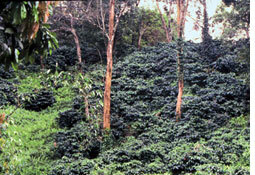 Tropical soils are highly weathered and already exhausted of nutrients. It was initially thought that phosphorus--a component of many plant enzymes--acts as the limiting factor in nitrogen fixation. The new study points at molybdenum, an important constituent of the enzyme nitrogenase that catalyzes nitrogen fixation, as the limiting factor. "Molybdenum is in short supply in many acidic tropical soils; weathering and leaching removes it over time. Furthermore, in the soil it interacts with organic matter and reduces its bioavailability," said Lars O Hedin of the department of ecology and evolutionary biology at Princeton University and a member of the research team. Previous studies have shown Mo to limit nitrogen fixation in legumes. This led the researchers to conduct experiments on lowland forest soils of Panama's Gigante peninsula. The researchers collected soil samples and added nitrogen, phosphorus and micronutrients (containing Mo) separately to the samples. Fertiliation with nitrogen decreased the activity of nitrogenase by 75 per cent, indicating that excess of soil nitrogen inhibits its own uptake. Previous studies have proved that the enzyme's activity decreases if excess of nitrogen is present in soils. But as soils in tropical forests have low levels of nitrogen, this finding ruled out that nitrogen fixation in forests is limited by natural factors. Both the other soil samples, one treated with phosphorus and the other containing a high level of molybdenum (about 500-600 micrograms of Mo per kg of soil), showed a 2-3 times increased activity of nitrogenase. But the results could be skewed because Mo is also present in trace amounts in phosphorus fertilizers, explained the researchers. Hence they tested the role of Mo added to soil at the level present in phosphate fertilisers which was about 40 micrograms of Mo per kg of soil. In this case, too, there was a noted increase in the activity of the enzyme. "Direct addition of either low or high levels of molybdenum increased nitrogenase activity," said Hedin. In contrast, adding molybdenum-free phosphorus fertiliser did not affect the rate of nitrogen fixation at all. The researchers thus concluded that nitrogen fixation was limited by Mo and not phosphorus. Prior to this study, it is the overlooked presence of this trace element in phosphorus fertilisers that had created the appearance of phosphorus being a limiting factor, said researchers. "Presence of molybdenum depends on the type of soil. It is not a problem where fertilizers are used, but in natural areas like forest soils, it is," said Anand Swarup, head of soil science and agricultural chemistry at the Indian Agriculture Research Institute. Given the colossal function that tropical forests are expected to perform, the view on tropical nitrogen fixation has to be broadened beyond traditional emphasis on phosphorus and nitrogen, said the researchers.